“How are sales?” is essentially the universal greeting between retailers. As retailers focus their attention on increasing sales, they ask, “How can I most effectively push for 'top line growth'?" Is it the economy? Location? Advertising? Low prices? No, not really. When it comes down to it, retail sales are driven by customers! In our view, the key to survival in retail is not profitable lines of merchandise, nor even profitable stores. Instead, those retailers who will survive and thrive will be those who have the most profitable customers! By using the Retail STRATA:G® Wheel to analyze and plan your business, you can refocus your store—not on merchandise or price, but on customers! The Retail STRATA:G® Wheel merges strategic marketing with strategic financial planning. By focusing on the customer who is most profitable for your business, you can more effectively make decisions about what financial changes can and should be made to maximize results and minimize risk. At this point, Ralph’s total assets were $1 million, of which inventory represented $600,000. 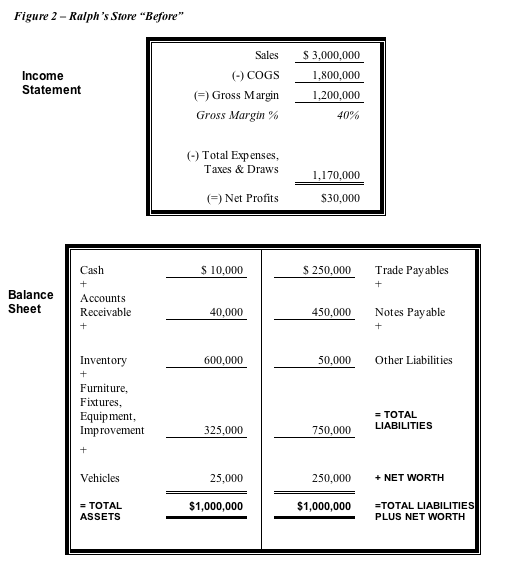 The other side of the balance sheet showed $750,000 in liabilities and $250,000 in net worth. From our viewpoint, Ralph’s customer base and sales trend were the areas of greatest concern. Ralph’s $3 million in sales not only wasn’t growing, it was netting him only one percent: $30,000! Like most retailers, Ralph knew a great deal about what he was selling but next to nothing about who was buying. The market Ralph traditionally depended on was shifting away from him, and Ralph didn’t even realize it. Another major concern was Ralph’s 3:1 debt-to-worth ratio ($750,000 in total liabilities divided by $250,000 in equity or net worth). Generally, a debt-to-worth ratio of 1:1 is “bankable” and 2:1 is about as leveraged as a retailer can be. At 3:1, with total liabilities of $750,000, Ralph was making less from his business than what he was paying in interest! Worse yet, with such a high debt-to-worth ratio, if Ralph needed more working capital, he probably couldn’t get a banker to loan him a dime. 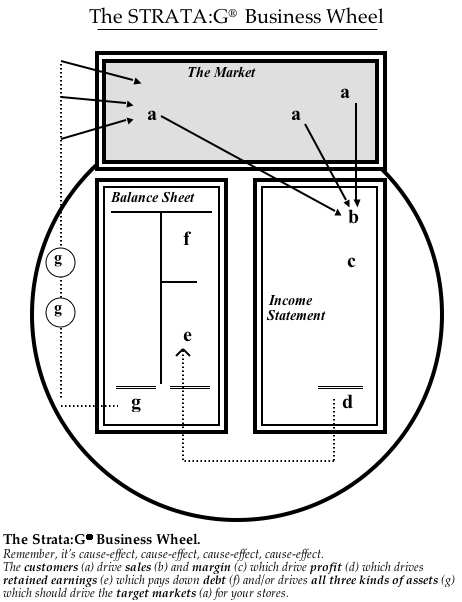 Customers (a) drive sales (b) and margin (c) which drive profit (d) which drives retained earnings (e) which pays down debt (f) and/or drives all three kinds of assets (g) which drive the target market (a) for any store. Not only did the Wheel show Ralph what to do and why to do it, it also helped him explain his decisions to his staff. And his banker! A) You always have the merchandise I need/want. B) The brands you carry. C) I can use a charge account. E) I’ve just always shopped here. Each response was noted along with the amount of the transaction, the frequency of shopping visits, and the customer’s ZIP code. When the results were tallied, some very meaningful findings emerged. What Ralph discovered was that the customers with the highest average purchases—the most “profitable” customers—came to his store not because it had a wide assortment of merchandise, but because the staff would patiently answer any question. Ralph started advertising with much more focus, both in ad message and media buys, with less cost (See Figures 2 and 3). He instituted a frequent buyer program in certain merchandise categories to build customer loyalty. And he began to eliminate duplicate items from his inventory. By focusing his inventory buys on that merchandise preferred by his most profitable customers, within six months Ralph had cut inventory from $600,000 to $450,000; turnover went from 3 turns (a four month's supply) to 4.2 turns (less than a three month's supply.) Fresher merchandise! 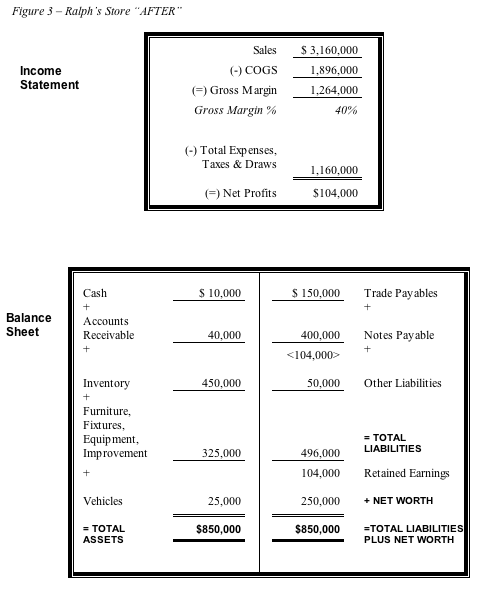 Of course, Ralph’s balance sheet continued to balance—total liabilities plus net worth equaled $850,000. So what decreased? Debt. $150,000 of it! Plus, the net profit of $140,000, in addition to being added to retained earnings, retired more debt! Ralph’s debt-to-worth ratio had fallen to 2.4 to 1 ($650,000 divided by $250,000), and dropped $140,000 further from the profit to $540,000 divided by $354,000, or 1.4 to 1.0! Ralph’s banker was a happy man. His vendors started shipping to him “on account” again and, mercifully, he wasn’t paying more in interest than he was making for himself. On an annualized basis, with his interest rate at 10 percent, he would save $25,000 ($254,000 less debt times 10 percent). Ralph planned to take $15,000 of that savings and spend it on more training (and bonuses!) for his staff. Who responded the most to these changes? The customers who wanted knowledgeable sales help. These customers now had reason to drive past the discounters and other competitors. Ralph was able to focus his entire operation—staffing, merchandising, in-store signage, advertising, pricing—to more effectively serve his priority customers. Ralph’s business is one example that, these days, bigger isn’t always better—better is better! A very modest increase in sales translated to a significant increase in profit. More important, it created substantial improvements in his balance sheet, which measures financial strength. Is a picture worth a thousand words? Maybe. But the picture of the Strata:G® Business Wheel was worth more than words to this retailer. It was the key to prospering in these times and beyond.